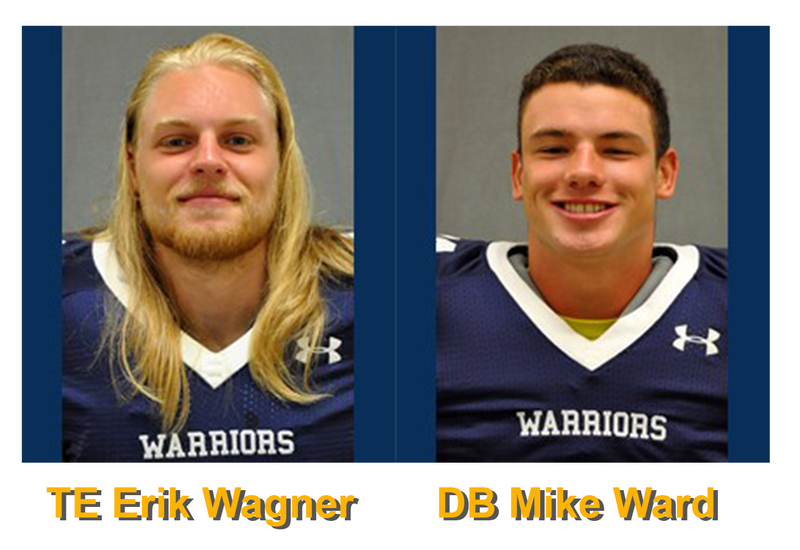 Williamsport, PA - Team Captains TE Eric Wagner (Warriors Mark, PA / Tyrone Area High School) and DB Mike Ward (Edgewater, MD / South Ridge High School) were voted by their teammates to be Team Captains for 2017. This is a special honor for both seniors as the Warriors venture into the 2017 football season. 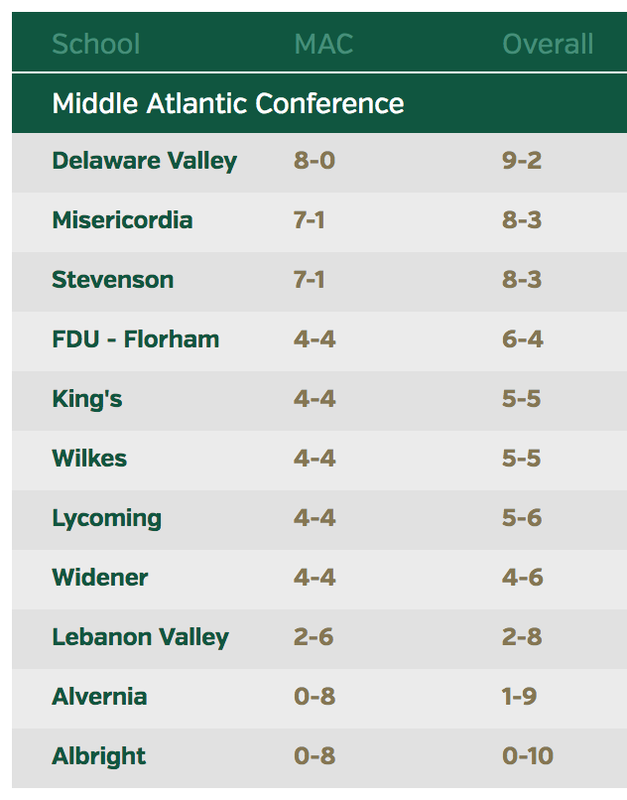 The team comes off a 2016 record of 3-7 with eight out the ten games won by a touchdown or less. 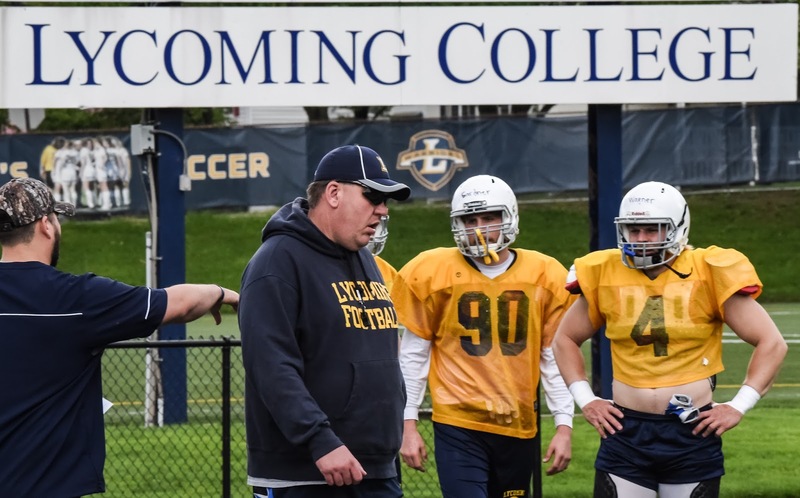 Lycoming is looking to greatly improve on that record. 1. Give a full effort all the time. The most important part of being a captain is leading by example. Because you are the captain, your teammates will look up to you and follow your lead whether you want them to or not. No matter the situation, your teammates need to see you working as hard as you can to win the game. Some ways to show your effort include not jogging when you should be running, and never giving up on a play. If you slack off, or give less effort, that is a sign that they do not need to try as hard either. This is especially important if you are losing during a game. Don’t let the situation dictate your effort. Let your teammates know that you will always give your best effort, even if you don’t win the game. It can be hard to keep that energy up while losing, and your teammates will need your example to help. #23 DB Mike Ward recovers a fumble and flashes "First Down Lycoming!" 2. Demonstrate good sportsmanship. On the field, you should treat your opponents with respect. After the game is over, be sure to shake their hands as well. No matter how contentious the game, congratulate them on a good contest. Let your teammates know it is okay and important to be respectful of the everyone playing. Be respectful to fans. You can always lead your teammates in saluting or applauding the cheers of your own fans after the game. Ignore booing, taunts, or insults to show your teammates that those things shouldn’t affect their performance. Never shout back or make obscene gestures in response to negative fan comments. Talk to your teammates about sportsmanship as well. Ask them to describe what they think sportsmanship means, and how they are going to practice it during games. That way they will know and understand what you are doing, rather than you hoping they pick it up. It never hurts to remind them of the proper way to treat each other and their opponents. #4 TE Erik Wagner getting instruction from the coaching staff. 3. Treat officials with respect. In many sports, captains are the only players allowed to talk to the referees. Don’t shout at the officials over calls you think they missed or got wrong. Remember that the referee is in charge on the field, and that you can’t let their calls affect your play on the field. In some sports, the referees will share certain rules with the captains that players should be aware of. Make sure you share these rules with your teammates and coaches to make sure everyone has an idea of how the official plans to call the game. In most sports, abusing the officials is a good way to pick up a penalty, or get yourself thrown out of the game. Not only will you be setting a bad example, but you will also be directly hurting the team. 4. Take responsibility for your mistakes. Part of leading by example is letting your teammates know it is important to own up to your errors. Don’t make excuses when things go wrong. If appropriate, apologize. Stand up and say, “I made a mistake there. Sorry everyone.” If you are not willing to accept responsibility, your teammates won’t have any reason to do the same. This is another piece of dealing with officials. If your teammates see you complaining about calls, it gives them an excuse to say the referee is the reason you are losing the game, rather than take responsibility for not playing well. Remember that this is for your mistakes only. It is not the captain’s job to accept responsibility for teammates’ mistakes. If you are always trying to take the blame, your teammates won’t be able to take responsibility for their own errors. 1. Stay positive. Don’t let your teammates believe they can’t win or be successful. Encourage your teammates after they make a mistake, let them know you believe things will go well. This doesn’t have to be a big speech like you’re in a sports movie. Simple encouraging phrases like “Let’s go!” or “We can do this!” can be helpful letting the team know you believe you can play well and win. This can be especially important if your teammate has been chewed out by the coach for a mistake. Piling on won’t help, so help pick him up. Let him know he can improve and that you believe he will do better the next time. A simple pat on the back and telling your teammate “It’ll be alright, you’ll get them next time” is a friendly reminder that you and the team supports him. Body language matters. Don’t do things like shrug your shoulders or throw your arms up in the air if a teammate makes a mistake. Even without saying anything, these kinds of gestures communicate negative feelings, and send a bad message to your teammates. 2. Talk to your teammates. As a leader, you want your teammates to know that they can talk to you about the team, their performance, or how the season is going. When facing a tough situation, like a player who doesn’t respond well to criticism or someone who is causing trouble, find ways to talk to them away from the rest of the team. Ask about his concerns and let him know how what he is doing hurts himself and team. Remember to be firm and consistent, and remind him that actions that hurt the team can’t be tolerated. Remember that, on the field, you are in charge. If you’ve decided how something should be done, communicate that quickly and confidently. Tell them “This is what we are doing,” and don't be afraid to explain your decisions. The more consistent you can be in explaining what you want to do will help your teammates trust and follow you. The team probably won't like every decision you make. That is one of the tough parts about being a leader. If they know they can trust you, it will be easier to accept your choices, even if they disagree or it doesn’t work out. Make sure you listen to your teammates’ suggestions for improvement as well. This lets them know that you value their opinion, and can take advice as well as give it. Besides, you know that your game can always improve. 3. Work with teammates. As a leader, your job is not just to tell your teammates what to do, but help them get there. Be willing to offer advice before and during practice to help everyone improve performance. This means talking to your fellow captains too. Lots of teams have more than one captain, so you need to be willing to work with your fellow captains to make sure you are all on the same page. 4. Set goals for your team. As a team leader, you need to be willing to set goals for your team to achieve. Look for personal and team milestones that you all can accomplish together. Concrete objectives can be great for keeping everyone focused on the same thing. Work with your coach to help create these goals. You want to make sure they are consistent with your coach’s vision for how the team should be run and the success you have. 1. Lead in practice. As a team leader, you know that practice is just as important as the game. Just like in games, you need to be willing to work hard to show your teammates that it’s important. Compete in every drill or practice session, and force your teammates to work hard to beat you. 2. Treat your teammates with respect. If you expect your teammates to follow your example, make sure you are the kind of person they want to follow. Stop rumors and gossip, and look for ways to encourage your teammates at all times. You need to be familiar with all of your teammates, including the best ways to motivate them. Not everyone responds to motivation the same way, so you’ll need to know the best ways to motivate and encourage each of them individually. Avoid team cliques. You are part of a team made up of players, not a team made up of teams. You won’t be able to make everyone friends, but you should be willing to break up groups that exclude other members. If you have personal issues with a teammate, it is always better to discuss them in private. You want to avoid calling out teammates in public, which can cause embarrassment, and make the disagreements worse. 3. Take charge without your coach. While the coach is in charge of the team, he can’t be everywhere at once, and will probably need your help. If you notice someone who needs help, offer it rather than waiting for the coach to notice. If it is time for practice to start, and your coach is doing something else, set up some stretching or a drill to make sure you are doing something productive. If you notice problems developing in teammate’s habits or their level of play that the coach can’t solve, call a player’s-only meeting to help one another discuss issues without the coach looking over everyone. 4. Build team spirit. Your team will work better when you are happy together. Find ways to build team spirit and encourage your teammates to interact with one another away from practices and games. Some good ways include holding a team dinner or party, making a team motto and even printing up shirts with it, or maybe creating a silly postgame tradition to recognize good performances. Even just briefly talking to your teammates when you run into them outside of practice or the game can help make them feel more like a part of the team. Many teams will have more naturally outgoing players that like organizing social events and other morale-boosters. It is okay to let someone else be the unofficial (or official) “social coordinator” as long as you support them and make sure the whole team is included. Not everyone on the team will be best friends, but doing social events together will help you all learn more about each other, and remind everyone of the importance of the team. 5. Do well away from the field. 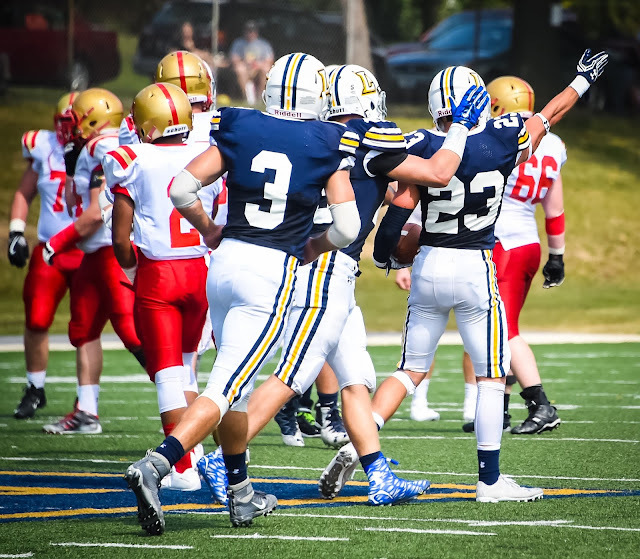 As a captain, you are not only the team’s leader, but one of its representatives to the rest of the community. Acting appropriately looks good for your team, and sets a good example for your teammates as well. If you play for a school team, this means doing well in your classes and staying out of trouble. In most high schools and colleges, you won’t be able to compete if your grades are poor, so make sure you and your teammates stay eligible. Set a good example for your teammates by getting the best grades you can, encouraging success on and off the field. If you are a professional athlete, avoid getting into legal trouble. As a captain you are one of the team’s most important public faces, and getting arrested or suspended is bad for your, and the team’s, image. It can also prevent you from playing, which doesn’t help your team at all. Whatever level or organization you play at, be careful about material you post on social media accounts. Keep your comments positive, both to your teammates and your opponents.